The water crisis in America is no longer a secret. Every day boil water advisories are issued all over the country and the different causes are alarming. Developed countries such as the United States are no different than other countries struggling with poor water quality. Residents and business owners alike are affected and the problems faced when it comes to clean water without harmful toxins and bacteria have been felt for decades. To safeguard the health of the community, boil water orders are sometimes required. Boiling water must be done before drinking it, making ice cubes, washing hands, bathing or anything that involves consumption of water. Bring water to a full rolling boil for a minute and then set aside to cool before using. The question is, how long will communities need to do this? Is There a Need to Be Alarmed? In 2016, there were series of water mishaps that caused US citizens a scare. There’s the ruptured water main in Brookline outside of Boston. Low water pressure in Northland, Kansas City. The presence of E.coli and low chlorine levels were also causes for a Texas Gulf Coast city to issue different boil water orders in less than a year affecting 320,000 customers due to aging water infrastructure. The list goes Boil on. Boil water advisories affect a number of people ranging from 50 residents at a time to as many as 400,000 residents. For days, weeks and months people need to boil water and suffer the consequences of the failing water infrastructure system in America. Experts say that America’s water system is in dire need of an overhaul. 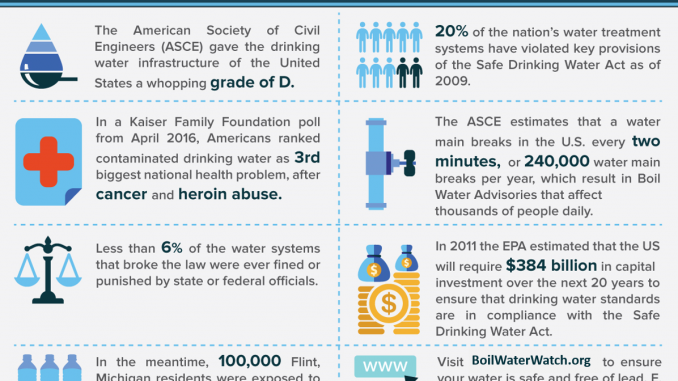 The American Society of Civil Engineers (ASCE) gave the drinking water infrastructure of the United States a GRADE D. The team from ASCE also stated in a May 2016 report that proper funding and necessary water infrastructure investment is needed. A lump sum of money is required in order to do this, a cry many have called for at the peak of the lead water contamination crisis that happened in Flint, Michigan. In 2011, the EPA estimated that the total amount required for water infrastructure in the US is $US384 billion in capital investment over the next two decades. This will ensure safe drinking water that is in compliance with the standards such as the Safe Drinking Water Act. The project funding for infrastructure totals to $US 1.4 trillion which includes the restructuring of water, electricity and transportation. According to the American Society of Civil Engineers (ASCE), every year there is an estimated 240,000 water main breaks in the US alone and about 650 breaks per day. Another one of the problems is the leaking water pipes for drinking that result to a loss of 7 billion gallons of clean and safe drinking water daily. Rebuilding water pipes is a tough job and requires time but if this helps to improve the water systems then it must be done to deliver safe drinking water where everyone can benefit from. Clean drinking water is a human right and must concern every individual.